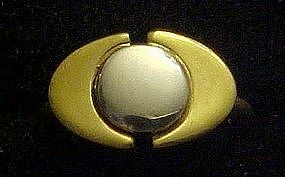 Vintage modern style ring called New Dimensions by Avon. Was originally sold in 1976. Sculped gold and silver tone. Self sizing adjustor inside ring fits up to a size 9. Excellent and shiny brite.